During fiscal year 2017, CBP in Buffalo reports they seized cash from a total of 10 people, and a total amongst those 10 of $144,733. I didn’t have any clients among those 10 last year, but I have handled cash seizure cases in Buffalo in the past. In years past, we’ve commented on the annual fiscal year report from CBP in Buffalo. Have you cash seized by CBP in Buffalo? 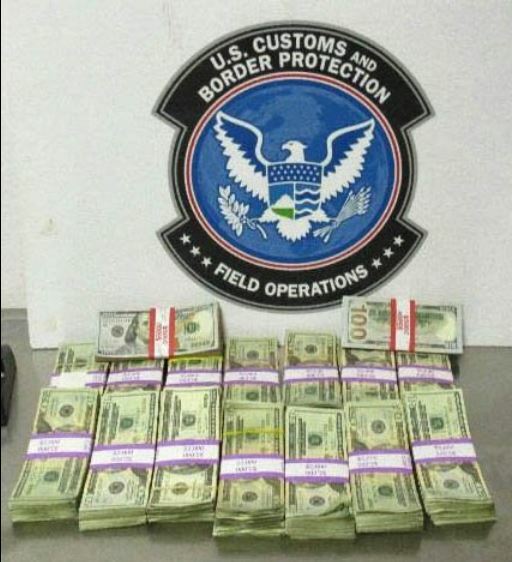 If Buffalo CBP seized cash from you can learn more about the process from our trusted customs money seizure legal guide and can contact us for a currency seizure consultation by clicking the contact buttons on this page. Cash seizures at airports have spiked in Detroit, and also apparently in other regions, such as Dulles airport. As a case in point, here is yet another story about CBP seizing cash from a traveler at the airport in Sterling, Virginia: Washington Dulles International Airport. U.S. Customs and Border Protection (CBP) officers seized more than $25,000 Wednesday from travelers departing Washington Dulles International Airport for violating federal currency reporting regulations.A Bosnia and Herzegovina-bound family reported to CBP officers that they possessed $9,000. The father then signed a U.S. Treasury form reporting they possessed $15,000.A CBP inspection discovered a total of $19,754 in U.S. dollars and 5,085 Euros, combined equivalent to $25,616 in U.S. dollars, in possession of the three-person family. CBP officers seized the currency and returned 985 Euros ($1,135 U.S. dollar equivalent) to the family for humanitarian purposes. No charges were filed. Officers released the family to continue their travel. This is CBP’s third outbound currency seizure in two weeks at Dulles. CBP officers seized $29,698 from a Qatar-bound family July 9 and $18,900 from a Ghana-bound man July 11. Read more about those unreported currency seizures. It is also true that none of the money is taxed, at least by Customs. If it is considered “income,” it may be taxable. But if you’ve already paid income taxes on the money, then it is definitely not taxable again by the IRS. Has CBP seized your cash at the airport? If CBP seized your cash at the airport, read our trusted customs money seizure legal guide and contact our customs lawyer for a free cash seizure consultation by clicking the contact buttons on this page. CBP has organized itself around a fiscal year that is different from the calendar year; every October 1 begins the government’s new “fiscal year”, and so too, begins CBP’s tracking of seizure activity at its various ports of entry. In years’ past, we have reported, in particular, on Detroit’s fiscal year seizure activity. For example, in 2015 CBP in Detroit had an exceptional cash seizure year during their fiscal year 2015, seizing more than $10 million from 540 people (roughly $838,924.58 per month). After that news was published, I was anxious to see what happened in 2016; but alas, not cash seizure summary for Detroit was ever published. So far this fiscal year which began October 1, ports within the Detroit Field Office have seized more than $4.4 million dollars, an 8 percent increase over the same time frame last fiscal year. To further break this apart, if $4.4 million is over a 7 month period, then it is $628,571.42 per month, or a decrease of more than $210,000 from FY 2015. We shall see what the future holds for FY 2017. In my spare time (ha ha), I will reach out to Detroit to see where I can get my hands on the totals for 2016. CBP in Lukeville Arizona seized $38,000 of concealed currency heading into Mexico. Every once in a while a seizure like this is not connected to the drug trade. I’ve represented people who’ve had cash seized crossing the border with Mexico who hid it in the vehicle just to keep it safe. In a case like this, even if the money came from a legitimate source and had a legitimate intended use the person involved is still responsible for a bulk cash smuggling violation. The consequences of that include forfeiture (permanent loss) of all the money, fines, and jail time. The best case scenario would be no criminal charges, and a return of most of the money. Have you had money seized going into Mexico? If you had money seized by U.S. Customs & Border Protection going into Mexico you can learn more about the process from our trusted customs money seizure legal guide and can contact us for a free currency seizure consultation by clicking the contact buttons on this page. In “Seizures of undeclared cash spike at Vancouver International Airport“, reporters for The Globe & Mail did a lot of good reporting work and present interesting information on customs cash seizures from Chinese nationals occurring in Canada. For instance, in the past 3 years customs seized $13 million dollars from 792 Chinese nationals passing through the airport. The average seizure was $17,000. The substance of the article is that these people are bringing the money into the country to get it out of China’s economy (which they fear may crash), to buy homes and/or invest in real estate. This has artificially inflated the property values in cities like Vancouver, and the government there imposed a tax on foreign purchasers of real estate to cool the market. We’ve previously blogged about this in Cash From China Seized Due to Capital Controls and Why some Chinese travel with cash leading to airport seizures. That is in addition to the $323-million declared at the airport by 20,000 Chinese citizens or passengers on flights to and from that country, during roughly the same period, according to data released to The Globe through a freedom of information request. Experts say these sums of hidden and declared money, which dwarf the funds brought through the airport from other countries, were likely carried by some of the 922,000 people from China recently given 10-year temporary visas, which allow them to visit for up to six months at a time. Former RCMP investigator and financial crimes specialist Kim Marsh said many travellers bring large amounts of money – or bank notes or drafts – instead of transferring them through institutional routes because they want to avoid paying taxes in Canada and get around Chinese currency laws that make it illegal for the average citizen to take more than $50,000 (U.S.) a year out of that country. Daniel Kiselbach, a Vancouver-based tax litigator, said the vast majority of Chinese citizens bringing large amounts of cash into B.C. are “just trying to get along in life and they have legitimate reasons for having the money in their possession,” such as buying gifts for family members or paying for living expenses at university. He said that these visitors have many disincentives to report their assets to the Chinese government and are likely just as suspicious of how information on their finances will be handled in Canada. “Maybe that would get back to the Chinese government, I don’t know,” Mr. Kiselbach said. Two years ago, Mr. Kiselbach tried to get Ottawa to divulge whether it has an agreement to share such information with China, as it does with the United States and other Commonwealth countries. Canada Border Services Agency does not make these agreements public, he said. Vancouver MLA David Eby, housing critic for the opposition New Democrats, said he is concerned that the amount of cash seized from Chinese citizens at YVR rose from $2.8-million in 2013 to $6.4-million last year. Experts say Chinese travellers could have several reasons for not declaring assets. Mr. Kiselbach added that CBSA likely ramped up the scrutiny on Chinese passengers because it gives increased attention to citizens from countries deemed a high risk for activities such as money laundering and financing terrorism. Hayley Howe, an anti-money laundering expert at Vancouver-based consulting firm MNP, said many foreign visitors may be unaware of Canada’s currency reporting requirements or unable to read the customs form properly when they enter or exit the country. Has U.S. Customs & Border Protection seized your cash? If U.S. Customs & Border Protection has seized your cash, you need a lawyer. Read our trusted customs money seizure legal guide and can contact us for a free currency seizure consultation by clicking the contact buttons on this page. In Philadelphia, CBP did what you might call a big, fat, greek cash seizure, when they seized $26,000 from a couple who were leaving the United States for Greece. U.S. Customs and Border Protection (CBP) officers seized more than $26,000 from a Greece-bound couple who violated federal currency reporting regulations at Philadelphia International Airport Wednesday. During an outbound inspection, the couple reported verbally and in writing that they possessed $17,000. During an inspection, CBP officers discovered multiple envelopes that contained a combined $27,052. CBP officers provided the couple a humanitarian release of $501 and seized the remaining $26,551. Officers released the couple to continue their travel to Greece. Why would the couple fail to report the extra $9,000 to CBP? There are some things we do not know for certain. For example, the CBP officer could have led the couple to believe they only needed to report their own money, not money they were carrying for others; they could have asked them how much money they were carrying “in your carry-on”, when the other money was stashed away in a purse. And they could have panicked. The story says that the couple was allowed to continue their travel to Greece. Most of my clients who’ve had money seized from Customs have to re-book for another flight, because the process of counting the money and seizing results can be a substantial delay. Sometimes my client’s don’t continue to their destination even if they can, because they have no money to travel with. I’ve had clients who’ve taken a month off work for a vacation to their homeland, only to have their money seized with no source of funds to continue on the trip until they get their cash back. When CBP seizes cash, it is very often a heartbreaking, stressful, and traumatic experience. But we are here to help! If you want to learn more about responding to a customs cash seizure in Philadelphia or anywhere else, read our trusted customs cash seizure legal guide and can contact us for a free cash seizure consultation by clicking the contact buttons on this page. Back in June, CBP made a big bust of $145,000 in “unreported” currency that was concealed in a vehicle’s rear quarter panels as the driver, a Mexican national, was trying to leave the United States for Mexico at the DeConcini border crossing. [On June 18], [CBP] officers conducting routine outbound inspections referred a 46-year-old Mexican man for an inspection of his Chevrolet SUV at the DeConcini crossing. Officers found more than $145,000 in unreported U.S. currency in the vehicle’s rear quarter panels. CBP seized the cash not just because it was “not reported” but because bulk cash smuggling — the fact of hiding the money in the quarter panel of a vehicle — is illegal and there are civil and criminal penalties for it. Because of the southern border’s famous ties to the U.S.-Mexico illegal drug trade, it’s hard to imagine a scenario where this money was not connected to illegal activity. Even if this man came upon the money in a lawful way — for example, it was a life insurance payout from his deceased father — there is still no good reason for hiding the money in the quarter panel of his vehicle. Or is there? Years ago, we represented a person who smuggled gold pieces across the U.S. Canadian border in the airbox of his vehicle, because they thought that would be safest spot for it on his journey through the U.S. to his return home in the heart of the country. So, while it’s very likely that this guy who had $145,000 hidden in his truck is a mule for the drug trade, attempting to move illict cash across the border… it’s definitely not the only explanation. As it is famously said, truth is stranger than fiction. Has CBP seized currency from you? Need help proving law source and intended use of bulk cash? Read our trusted customs money seizure legal guide and can contact us for a free currency seizure consultation by clicking the contact buttons on this page.